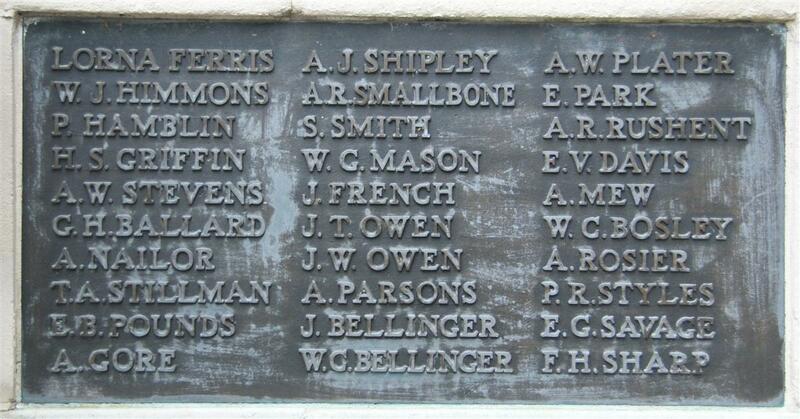 The name A Parsons appears on the first tablet of the Newbury Town War Memorial, but no trace has been found of any A Parsons associated with Newbury apart from Albert Thomas Parsons. Unless further information comes to light it would appear that this A Parsons entry is a duplicate entry for Albert Thomas. While no clear evidence has been uncovered about the process through which names were included on the memorial it does not seem to have been a particularly thorough or meticulous one. I suspect that the duplication in this case arose from the use of two sources for the names – the direct submission of names by townspeople (in this case Albert’s wife Emily) and the collection of names from pre-existing church memorials. A Parsons appears on the Speenhamland Shrine, the memorial for the parish of St Mary’s, Speenhamland, which included Pelican Terrance, where Emily’s parents lived at number 1. Following her husband’s death in November 1915 Emily brought their three young children to her parent’s home before finding independent accommodation in Brixton Rise, an alley off Cheap Street. It is easy to see how the collator of the names could see A Parsons, Pelican Terrace, Speenhamland as different from A T Parsons, Brixton Rise, Newbury.